Now translated into Spanish, French, Hebrew and Yiddish. 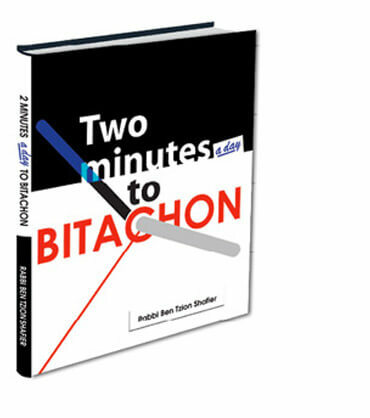 Two Minutes to Bitachon will strengthen your Bitachon, answer many difficult questions, offer inspiration, insight and direction. Join us as Rabbi Shafier goes through the foundations of Emunah and Bitachon, first explaining, then showing real world applications, and finally offering practical techniques for growth. You will walk away with a solid understanding of our belief system, the inspiration to grow, and with answers to many plaguing questions. This book is absolutely indispensable for every Jewish person to read! Stop Surviving Start Living gives you the essentials you need to enjoy life on this world the real way: Through the Torah’s timeless wisdom! Very down to earth with examples that hit close to home. A powerful tool for any person looking to grow in Yiddishkiet. Keep up the amazing work! I “learned” the book with a friend every night… We both looked forward to it every single day. Not being able to call each other up on Shabbos to learn was hard to get over- a night without the Shmuz just wasn’t the same. The Shmuz puts so many major life issues into perspective, clarifies important topics and all at the same time captivates the reader. Thank you so much! What is the difference between Emunah and Bitachon? If the amount of money is set on Rosh Hashanah, why should I work? How do I find the balance between the right amount of Bitachon and Hishtadlus (effort)? This enjoyable and highly engaging volume will gently propel the reader to view life from a loftier vantage point. Read it and soar! We know that we are supposed to have Bitachon. We know that HASHEM determines every outcome. But what does that mean? Where does that leave free will? What does perfect Bitachon look like? Is there such a thing as partial Bitachon? What are real life tests of Emunah? And more than anything, how do we strengthen our beliefs – making them real? “Captures the reader’s mind and heart through vivid imagery. A must-read for anyone who is looking to find true meaning and fulfillment in life.